OtherPeoplesPixels: In your interview with Little Paper Planes you mention a compulsion to make work and the meditative experience of painting. Repetitive tasks can be both soothing and monotonous. They can engage your mind or they can free it. In general, what do you think about while you paint cupcakes and presidents over and over again? Justin Richel: If all is going well while in the act of painting, I am thinking of only line, color and the emotional response. It’s a very interesting and blissful place for the mind to be. OPP: How does your experience of repeatedly drawing similar objects shift over time? JR: I usually have a specific image or sense of a particular painting or piece that I set out to create in my mind’s eye before hand, but through the process of translating that idea or wisp of an idea, from a thought to the physical paper, I am always a bit disappointed by the outcome. I feel that with each remaking of a particular idea, the message becomes more clear for me, as though I am able to communicate my idea more clearly with each attempt; understanding my own motivations through the repetition of the imagery. It also gives the image a life of sorts; you see it evolve over time. When I was at Maine College of Art my major was in printmaking. I never really liked the process of printing very much. I felt that it was too limiting and often monotonous as well as a very dirty process. A lot of energy was expended with the only real benefit being that you can produce multiples of the same image. However, through the print making process, I realized the strength of the multiple. Images, if they are successful, do proliferate either by a cultural embrace or by the interests of a few, they are integrated and bent, changed and imposed upon, and I think it is this phenomenon that urges me to revisit these compositions again and again, manipulating and changing them to suit my own needs. In a sense creating my own iconography. OPP: You have many pieces titled Whirling Dervish, the first one a drawing in 2008 and the most recent your installation of gouache on cut paper at the Ogunquit Museum of American Art in 2011. 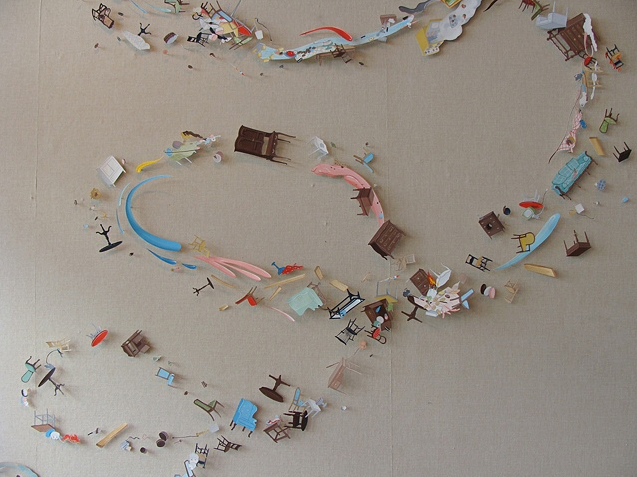 Then there’s Debacle (2011), a wall drawing you did for the DeCordova Museum, which puts the viewer inside the whirling dervish. How does the shift in scale and media change the meaning of the imagery? JR: I have actually been working with most of these themes since the early 2000s and continue to find the rehashing of subjects and compositions completely engaging. I’ve found that the small work draws you in, engaging the viewers’ imaginations, encouraging them to lean in for a closer look, and allowing them to revel in all the fun details. The large work consumes the viewer wrapping them in the imagery. Most people find the miniature works very cute and whimsical, which they are. But there are darker undertones embedded in the work that I really want to be seen and understood. With the larger work my hope is to dwarf the viewers sense of self with the compositions so that the audience feels like a part of the piece. OPP: Do you see any of these as more successful than the others, in terms of communicating with your audience? JR: So far I think that through the use of various sizes and approach, the work’s message is communicated more clearly, each painting or installation telling a bit more of the story. As of late I am most excited about creating the installation works. They provide me with an opportunity to create an image that just isn’t possible in the confines of my tiny studio. The installation works are composed of hundreds of tiny parts and pieces that allow me to change the overall composition, keeping it a fresh exploration through each evolution. 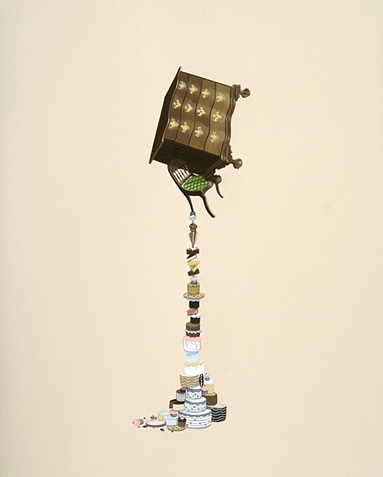 OP: The theme of precariousness is very present in your works, as depicted in the columns and unstable piles of sweets, household goods, presidents’ heads and birds. You’ve written in your project statement: "The stack can only exist so long as all of its pieces are cooperating together, to shift or remove a piece would inevitably send the whole thing crashing to the ground." But, because your main medium is painting, you can endlessly stack objects in more impossibly complex ways without any real danger. You hold the viewer in an endless state of expectation of collapse. Do you have any interest in addressing what happens after the balance is actually lost, when things come crashing down? Justin Richel: No, not so much. I think it is much more interesting to play with tension—I like creating that suspense and having the viewer’s own imagination complete the story. My hope is that the work communicates the sense that through cooperation of disparate parts and pieces acting as infrastructure, this odd stack or structure is able to exist. Just looking at the structure of present day society, it becomes very clear how precarious things really are. There is a real feeling that you have to hold up your end of the bargain. I think everyone is afraid of what might happen when it all falls apart and you don’t want it to happen on your watch. So we keep adding to and building the “system” so that it holds up, even as it falls apart during the process. OPP: Looking at your various projects together, I see a strong sense of the interconnectedness of nature, culture, and the personal. Just like with the stacked furniture and sweets, nature and culture are precariously intertwined in our lives. You’ve worked simultaneously on the series Sweets and the series Big Wigs over the last few years. Could you talk about the differences between these two series, as well as how they inform each other? Justin Richel: The Sweets series is concerned with society as a whole: its behavior, its morality and constructions, the general state of things. 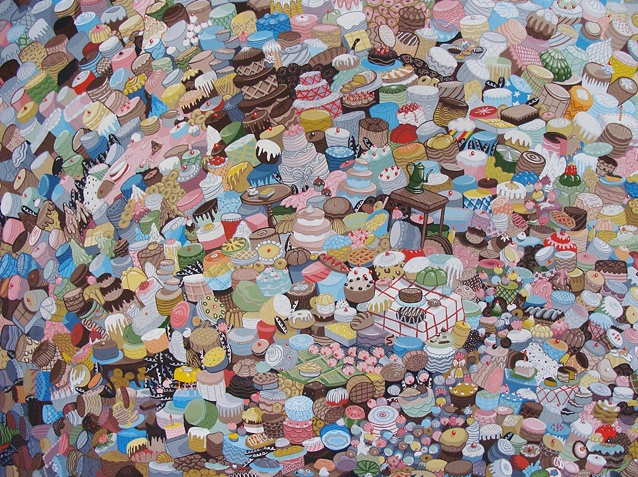 I like to think of the sweets and household detritus as characters or stand in for the figure, humans, and their relationships to one another. Creating scenarios that speak to the fragility of circumstance and the consequence of actions. I like to imagine them as functioning, dysfunctional infrastructures. I get a certain amount of pleasure creating the Wig paintings. They’re about the idea that if anything sits still long enough, nature will take root and treat that object as though it was simply landscape, a foothold, claiming or re-claiming the space as it’s own. I find the regenerative process of nature very comforting. It takes care of itself of it’s own volition. It’s a feeling of security and trust and one of relief. Nature’s design is one of perfect balance. In contrast, our own brand of design leaves so much lacking; not everyone is represented or even figured into the equation. Nature is both simultaneously finite and infinite. It is necessary for me to have the two distinct series as a way of communicating this complex relationship. OPP: What’s next for you? Any upcoming shows or new directions for your work? JR: Well, for 2012 so far I have a solo show at Galerie Voss in Düsseldorf, Germany (TBD) and a group exhibition, curated by Natalie Larson, at Marshall University in Huntington, WV. And in the spring my fiancé Shannon Rankin and I will have a two person show at June Fitzpatrick Gallery in Portland, ME. 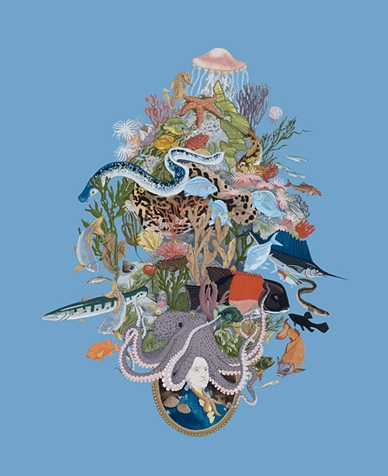 Justin Richel has also recently released a beautiful print through The Endangered Species Print Project, which is sponsored by OtherPeoplesPixels. 100% of the proceeds from Justin's print support the endangered Guam Micronesian Kingfisher depicted in his charming work. 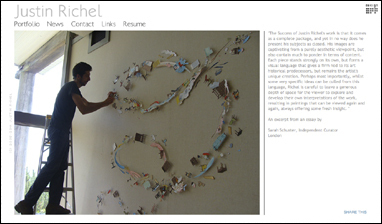 To view more of Justinʼs work visit justinrichel.com.